408 & 436 Downtown Orlando Area Free Mulch! 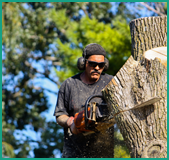 When you need tree service in Orlando that you can depend on, look no further than Affordable Arbor Care. Our fully licensed and insured company serves Central Florida in all of its trimming, pruning, and tree health needs. Each employee is equipped with workers' compensation, and we have a $2,000,000 liability policy. Affordable Arbor Care never sacrifices the safety, health, and longevity of your trees because of service costs. Safety is our first priority—we complete your job promptly, but never at the cost of quality. We write your estimates clearly and carefully, with plenty of details to ensure that both parties understand. Contact us today to request a pre-risk assessment with our tree care specialists at no extra cost and our Orlando tree service team.